ruffus.drmaa_wrapper.run_job() works with python3 (github) Fixed issue with byte and text streams. New object-orientated style syntax works seamlessly with Ruffus command line support ruffus.cmdline.run (github). Thanks to the suggestion of Milan Simonovic. @transform(..., suffix(...) ) has easy to understand syntax and takes care of all the common use cases of Ruffus. However, when we need to place the output in a different directories, we suddenly have to plunge into the deep end and parse file paths using regex() or formatter(). Now, @transform takes an optional output_dir named parameter so that we can continue to use suffix() even when the output needs to go into a new directory. Decorators can take named parameters. These are self documenting, and improve clarity. Ruffus Pipelines can now be created directly using the new Pipeline and Task objects instead of via decorators. This new syntax is fully compatible and inter-operates with traditional Ruffus syntax using decorators. Apart from cosmetic changes, the new syntax allows different instances of modular Ruffus sub-pipelines to be defined separately, in different python modules and then joined together flexible at runtime. The new syntax and discussion are introduced here. Ruffus v2.5 is now python3 compatible. This has required surprisingly many changes to the codebase. Please report any bugs to me. It proved to be impossible to support python 2.5 and python 3.x at the same time. Ruffus now mostly(!) terminates gracefully when interrupted by Ctrl-C . Please send me bug reports for when this doesn’t work with a minimally reproducible case. The graphics for each task can have its own attributes (URL, shape, colour) etc. by adding graphviz attributes using the @graphviz decorator. This allows HTML formatting in the task names (using the label parameter as in the following example). HTML labels must be enclosed in < and >. E.g. label = "<Line <BR/> wrapped task_name()>"
label_suffix = "??? ", label_prefix = ": What is this?" The verbosity levels are now more fine-grained and consistent between pipeline_printout and pipeline_run. Note that At verbosity > 2, pipeline_run outputs lists of up-to-date tasks before running the pipeline. Many users who defaulted to using a verbosity of 3 may want to move up to verbose = 4. Please contact me with suggestions if you find the abbreviations useful but “aesthetically challenged”! Some pipelines produce interminable lists of long filenames. It would be nice to be able to abbreviate this to just enough information to follow the progress. BUG FIX: Output producing wild cards was not saved in the checksum files!!! Can speed up trivial tasks: Previously Ruffus always added an extra 1 second pause between tasks to guard against file systems (Ext3, FAT, some NFS) with low timestamp granularity. Optional helper module allows jobs to dispatch work to a computational cluster and wait until it completes. The expressions inside @active_if are evaluated each time pipeline_run, pipeline_printout or pipeline_printout_graph is called. Dormant tasks behave as if they are up to date and have no output. By default ruffus accumulates NN errors before interrupting the pipeline prematurely. 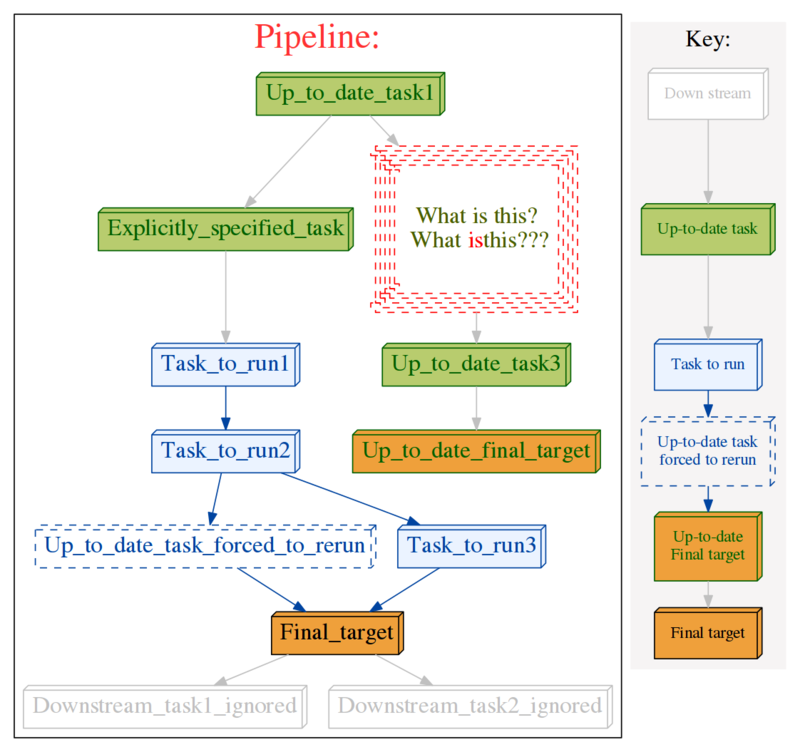 NN is the specified parallelism for pipeline_run(..., multiprocess = NN). Otherwise, a pipeline will only be interrupted immediately if exceptions of type ruffus.JobSignalledBreak are thrown. By default, Ruffus re-throws exceptions in ensemble after pipeline termination. logger.error(...) will be invoked with the string representation of the each exception, and associated stack trace. File date and time are displayed in human readable form and out of date files are flagged with asterisks. Regular expressions within ruffus are very powerful, and can allow files to be moved from one directory to another and renamed at will. However, using consistent file extensions and @transform(..., suffix(...)) makes the code much simpler and easier to read. Previously, suffix(...) did not cooperate well with inputs(...). For example, finding the corresponding header file (”.h”) for the matching input required a complicated regex(...) regular expression and input(...). This simple case, e.g. matching “something.c” with “something.h”, is now much easier in Ruffus. The \1 matches everything but the suffix and will be applied to both globs and file names. For simplicity and compatibility with previous versions, there is always an implied r”1” before the output parameters. I.e. output parameters strings are always substituted. globs and tasks can be added as the prerequisites / input files using inputs(...) and add_inputs(...). glob expansions will take place when the task is run. The standard @split divided one set of inputs into multiple outputs (the number of which can be determined at runtime). This is a one->many operation. An advanced form of @split has been added which can split each of several files further. In other words, this is a many->"many more" operation. Ruffus uses “\1” and “\2” in regular expression substitutions. Even seasoned python users may not remember that these have to be ‘escaped’ in strings. The best option is to use ‘raw’ python strings e.g. Ruffus will throw an exception if it sees an unescaped “\1” or “\2” in a file name, which should catch most of these bugs. An SVG bug in firefox has been worked around so that font size are displayed correctly. add_inputs(...) allows the addition of extra input dependencies / parameters for each job. @jobs_limit Some tasks are resource intensive and too many jobs should not be run at the same time. Examples include disk intensive operations such as unzipping, or downloading from FTP sites. would limit the unzip operation to 4 jobs at a time, even if the rest of the pipeline runs highly in parallel. When the pipeline runs, task functions will not be run. Instead, the output files for each job (in each task) will be touch-ed if necessary. This can be useful for simulating a pipeline run so that all files look as if they are up-to-date. Only the output from pipelined jobs which are currently out-of-date will be touch-ed. In other words, the pipeline runs as normal, the only difference is that the output files are touch-ed instead of being created by the python task functions which would otherwise have been called. The inputs(...) parameter in @transform, @collate can now take tasks and glob s, and these will be expanded appropriately (after regular expression replacement). Advanced form of @split This is an experimental feature. Hitherto, @split only takes 1 set of input (tasks/files/glob s) and split these into an indeterminate number of output. Sometimes it is desirable to take multiple input files, and split each of them further. This is a many->many (more) operation. It is possible to hack something together using @transform but downstream tasks would not aware that each job in @transform produces multiple outputs (rather than one input, one output per job). Tasks following split_files will have ten inputs corresponding to each of the output from split_files. If @transform was used instead of @split, then tasks following split_files would only have 3 inputs. File systems with 1 second timestamp granularity no longer cause problems. Added proxy_logger module for accessing a shared log across multiple jobs in different processes.